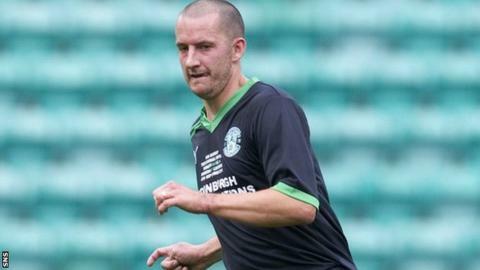 Former Hibernian midfielder Guillaume Beuzelin has rejoined the Scottish Premier League club as a coach at their youth academy. The 33-year-old was last with Olympiakos Nicosia in 2010 but retired through injury. In 2011, he became a coach at Falkirk's academy and, from January, he has been head coach of Stirling University's second team. Beuzelin said: "I couldn't turn down this offer. I'm delighted to be back." The Frenchman spent four years at Easter Road after arriving from Le Havre in 2004. Beuzelin moved on to Coventry City and had a brief spell with Hamilton Academical before heading for Cyprus. He returned to Scotland and had a successful trial with Kilmarnock, but his hopes of a contract were dashed when he failed a medical and he retired as a result of a series of injuries. Now Beuzelin has been assigned the task of coaching Hibs' under-14 team. "I've been asked by the club to come back and to become a coach of the youth academy," he told the Edinburgh club's website. "It is a club that I'm very passionate about and I'm looking forward to the challenge. "I've been told there are no former players coaching within the youth system. "I'm a former player, so I know and love Hibs, but I'm also foreign, so hopefully I can bring some different ideas. "With all my experience of playing in different countries, I hope to be able to bring something different and beneficial to the club and help to develop quality Hibs players."